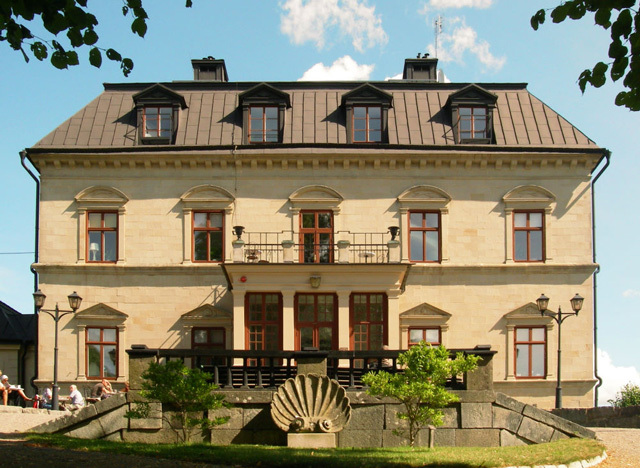 Ownership / Access: Jarfalla Municipality..
Notes: Gorvaln House is a manor house at Jarfalla Municipality in Stockholm County in Sweden. Gorvaln House is located at Gorvaln, a bay of lake Malaren. The manor is since 2008 used as a hotel and restaurant. Garvaln House is documented from the 1460s, when it was two farms, owned by the Archdiocese of Uppsala. After the Protestant Reformation in 1520, Gorvaln became a kronohemman, owned by King Johan III until 1571, when Johan III gave it away to the nobleman Antonius de Palma and his family. 1605-61 Gorvalns was owned by the Swedish noble family Bjelke. During the Bjelke era the main building was lower on the connector than today. During Adolph John I's years as owner, a new main building was built. It is now owned by Jarfalla Municipality.